Which, in practical terms means, 3.75 inches done since the row of waste yarn was added. The image is the sole side, with the waste yarn very evident. The afterthought heel, will, I know from experience, add another 1.75 inches. This will make the total 5.5 inches, (even though the heel isn't there!) and I also know, (from experience) I like mid calf length socks (circa 9 inches measure from the floor/base of the heel. So it won't be long now. Four inches or so, and the leg of the sock will be done. The last few rounds, well almost 1.5 inches, will be ribbing, leaving just 3 more inches of plain stocking knit.. Oh wait—I am not working in plain stocking knit! It's a wide rib (4 X 1) and the cuff will be combination of 2 x 1 and 1 x 1 ribbing—because I really like it when the cuff pattern and leg pattern play well together. Yesterday, I packed up 2 more sock kits—one in a pastel multi color/stripe, Shades of blue, and taupe with some pale green and creams) another color way of Lana Grossa. 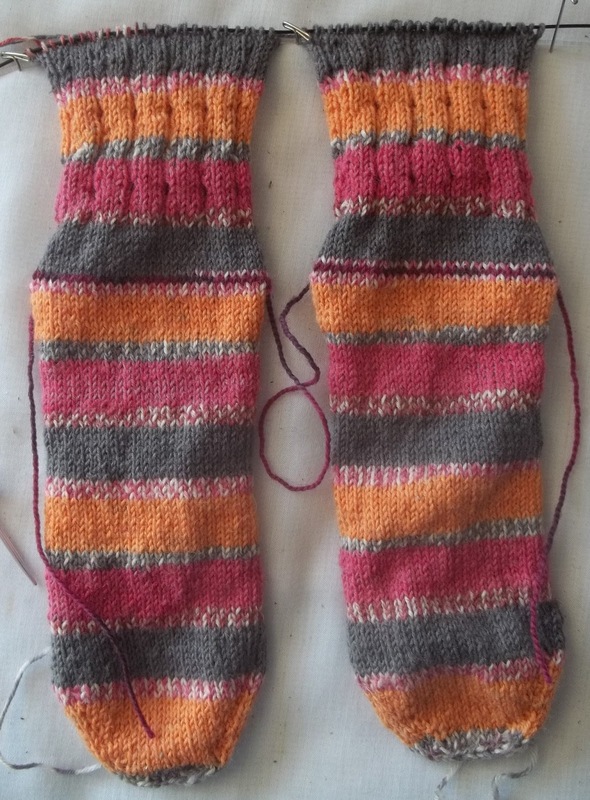 The other a self striping yarn—with a contrasting cuff planned. (Reynolds yarn as recall) . I started these sometime in the past, and broke a circ as I recall... So they are back into the rotation—I haven't decided if I want a lacy cuff, or a ruffled one (a double ruffled one!) or something else... I have some time to think about it..But when the time comes, the bag is packed, yarn and needles and a collection of notions. After these, I plan to make a pair of mens socks—another pair for my Son-in-Law—likely a self striping pair—the first two pairs I made were plain and bland, (one pair of dark taupe, one pair of medium grey) This next pair will be greys and navy—since I found I four skeins in this color way--(and another 4 skeins in the same colors, but in a different brand, and self stripe with a jacquard. I remember these –clearance sale specials, at a $1 a skein—from my early days of serious sock knitting.. (I also found I still have 1 (100g) skein of Lion Brand Magic stripes—in the “denim” color way of mixed blues with some red and white added for interest. That yarn was discontinued about 8 years ago--(I bought out the clearance bin—over a dozen skeins at $0.50 each)--I made (and I am still wearing!) a dozen or so pairs with this yarn, and traded a few skeins, too. I had every color way--the light blue "regatta", the red and black "lumberjacks", the "denim", plus jacquard stripes in purple (2 pairs) blue (another 2 pairs) and brown, There was a bright color way (hot pink, neon green, red and navy) that I really hated--I overdyed it--and made a plum, teal, purple and blue color way that worked much better! At $0.50 for 100 g of yarn, I wasn't going to let it pass no matter that i really didn't much like the colors--I bought several skeins of this color way--one skein became socks for a granddaughter, and 2 others got swapped--One person loved the colors, the other, liked my overdyed results, and did the same (overdyed that is) with a different color. Going through my stash of sock yarns excited me.. I have some wonderful yarns in there, even a skein of home dyed--(in shades of purple/plum/green) I want to knit them all!